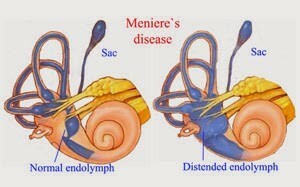 Meniere’s disease is a disorder of the inner ear that can affect hearing and balance. 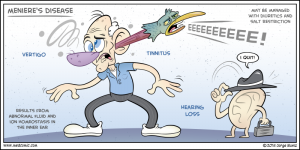 It causes spontaneous episodes of vertigo – a sensation of a spinning motion – along with fluctuating hearing loss, ringing in the ears (tinnitus), and sometimes a feeling of fullness or pressure in the ear. In many cases, this disorder only affects one ear. People in their 40s and 50s are more likely than other people to develop Meniere’s disease, but it can occur in anyone, even children. The cause of Meniere’s disease is not well understood. It appears to be the result of the abnormal volume or composition of fluid in the inner ear. The inner ear is composed of connected passages and cavities called a labyrinth. The outside of the inner ear is made of bone and the inside is a soft structure of membrane that is slightly smaller, but similarly shaped version of the outside. The inside of the inner ear contains a fluid and is lined with hair-like sensors that respond to movement of the fluid. In order for all the sensors to function properly, the fluid needs to keep a certain volume, pressure and chemical composition. Factors that alter the properties of the inner ear fluid may be a cause of this disease. Scientists have proposed a number of potential causes or triggers such as: improper fluid drainage, an abnormal immune response, allergies, viral infection, genetic predisposition, head trauma (concussion), and migraines. However, because no single cause has been identified, it may be that Meniere’s disease is caused by a combination of factors. Other factors to consider would be a high level of tension and anxiety, a high salt intake in the diet (this increases fluid retention), high cholesterol levels, and glandular and hormonal imbalances (including hypothyroidism). In acupuncture, dizziness is usually attributed to obstruction of the orifices by phlegm and dampness. This can be a cause for the vertigo along with symptoms of nausea and vomiting. Often there is also a kidney yin deficiency which results in liver wind not being grounded and rising to the head causing vertigo, dizziness, headache, blurred vision and tinnitus. The points used in acupuncture will be on the scalp and around the ears, but they can also be on the body. The main goal of acupuncture depends on the symptoms of each patient but will mainly focus on helping to restore balance in the kidneys in order to better control the liver wind. Points around the ear will help to restore proper circulation of Qi to help with the dizziness, tinnitus and hearing difficulties. 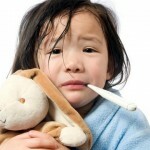 Other points may be used in order to resolve symptoms such as nausea and vomiting. A change in diet can also be of benefit to those who suffer with Meniere’s disease. Suggestions would be to reduce cholesterol, reduce fluid intake, stop consuming alcohol, and eliminate added salt from the diet. The reduction of salt intake is very important, as salt increases fluid retention and pressure in the inner ear. Eliminating coffee and cigarettes is important as well because they constrict blood vessels.